Every smartphone brand is now switching to a punch hole. 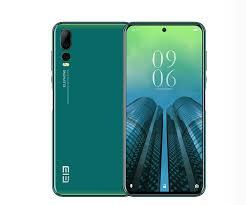 It seems the notch will soon be outdated as even the Elephone is now adopting the punch hole screen display. The Elephone is a decent smartphone with an impressive camera set-up and a punch hole. The phone offers almost 100 percent screen to body ratio. It comes with generous inbuilt memory and an ample RAM. On the body, the Elephone A7 is built with the combination of metal and glass. The most exciting features are the panel that house triple rear cameras on the left side that is vertically placed which is similar to the Huawei P20 and the P30 smartphone. It’s available in multiple colors that include Green and Black. The fingerprint sensor is placed on the right side below the power button. On the front, the phone has a large screen size of 6.41 inches under IPS capacitive touchscreen. It has a screen resolution of 2340 x 1080 Pixels with 402 PPI density which will deliver clear visuals. On the camera department, the Elephone A7 has a triple rear cameras configuration. The primary camera consists of 48 Megapixels + 13 Megapixels + 8 Megapixels with dual LED flash. The camera comes with other internal features and it can shoot [email protected], [email protected], [email protected] video resolution. On the front, it has a front camera of 16 Megapixels with Face Recognition hidden on the punch hole. The Elephone A7 has a MediaTek Helio P60 (MT6771) chipset with an octa-core processor that clocked at a speed of 2.0 GHz. The SoC is built with 12nm process technology and it has ARM Mali-G72 MP3 for graphics. It’s powered by Android 9.0 Pie operating system. The internal memory on the phone is 64GB which is enough to accommodate all the files and data you will install. It also has a slot for an external SD card which allows you to expand the specs up to 256GB. The memory is paired with 6GB RAM for smooth performance. The sensors on the phone are Proximity, Light, Accelerometer, Compass, Gyroscope and Fingerprint sensor. The Elephone A7 has a two Nano SIMs which has support for 4G LTE network. It also has Wi-Fi 802.11 a/b/g/n/ac, 802.11 n 5GHz, Dual Band, Wi-Fi Direct, Wi-Fi Hotspot for wireless connection with Type-C USB 2.0 with OTG for file transfer and charging. Furthermore, it has GPS, A-GPS, GLONASS, BeiDou for location tracking. The Elephone A7 has a nonremovable battery capacity of 4000 mAh with fast charging technology. On the price, the phone is expected to sell at a price of $285.